I really didn't mean to go into the hospital. I really just meant to get some meds from my doctor and come back home. Monday, however, had another plan for me. I went to see my normal Doctor for some antibiotics to help my system battle with what felt like bronchitis...and also get vaccinations for our upcoming trip to Mongolia and the States. We were having a relaxed morning at the Rodriguez house, save for the fact that I had again had another sleepless night. The bronchial passage in my body is normally stressed by allergens, dryness and mucus...all of which were present for the last three days and keeping me from a restful night. I told Mario I would go to Dr. Venter to get a diagnosis for what I suspected had turned from viral to bacterial. When I arrived at my doctor's the office was packed with other people, most of them sick and coughing, and I shielded myself from them by sitting in a remote corner, all the while determined not to look sick myself. I saw Venter's associate (eventually) a new woman Dr. who looked as bright as anything and proved to be, judging from her quick synopsis of things. While listening to my lungs, she told me she heard fluid, and wanted to make sure I didn't have pneumonia, considering my past and my asthmatic tendencies. She suggested I go straight to the hospital for tests and a chest x-ray, which I did. They admitted me and began a whole blood panel and x-ray regime. I submitted to the hospital staff, all busy and pretty new to nursing, judging from their green attitudes and questions. It wasn't long before they brought up the subject of intravenous antibiotics. While they were talking, I interrupted and suggested they bring in the guy who did my blood draw, from the lab. They assured me that it was okay, and that they would do it themselves. I tried to explain about my small veins, my desperate struggle for air lately (shrinking them) and my aversion to bumbling nurses. In vain. The first nurse was a beautiful, gentle and sweet girl named Elizabeth. She tried twice to get a vein, the first time missing and the second time hitting a nerve I felt in the back of my skull. As I screamed, I looked down and saw a gushing geyser in my wrist, something Elizabeth was trying to back out of. She apologized, after mopping up a puddle of blood and brought in another nurse: a pregnant and tired looking Beatrice. Beatrice found a vein right away, but went too far and hit tissue. I winced, but stayed still, all the while enduring the painful current that went from my arm to the inside of my brain -- and seemed to go on forever. She struggled to attach the plastic tube and further irritated the puncture. I cried tears of great size and told her, "Something's wrong." "Don't worry, my dear," she said. "It's in and it's over." She looked down at her handiwork, a bloody and swollen mess that was already back-spilling blood into the clear plastic tube. She flushed it back with a syringe, sending more shooting pain into my arm (and my teeth). As she left, I whimpered, crying in real pain and knowing that I was unheard. If the IV was going to drip, it would be a miracle. Two hours later I was begging for them to remove the IV and to let me go home. My swollen arm had gone up to my shoulder and they seemed to dismiss my sobs as normal patient moaning. I finally threatened to rip it out myself, and Mario, next to me, was on pins and needles... waiting for them to hurry up and remove it. As they took out the needle, purple discolored blood spewed out of the opening (that seemed unusually large). I gasped and cried more...sincerely in pain. The apologetic nurse (a new one named Gift) pushed a cotton ball against it and taped it down. He explained that I would have to have it replaced and he was coming back with his supervisor. A new nurse came in, an Afrikaans woman with a short hairdo. She charged into my curtained space with such force that it startled both of us. "Hello Miss," she said. "I hear you don't want an IV. It's doctor's orders and we MUST put it back in." She looked so sure of herself and confident that I knew I would have to agree; and I did. 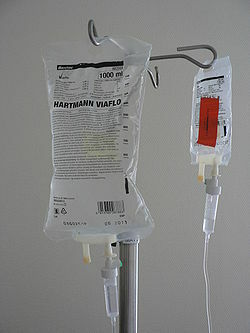 In one simple prick, the bold nurse got the vein that would deliver the drip for good. She un-gloved her hands in triumph and looked down at me, and nodded. She left as quickly as she came, with the saline and antibiotics peacefully delivering healing into my bloodstream. By the time my doctor came, she saw my cottoned arms and teary eyes and anounced she was giving me something "to calm your nerves". I gladly accepted. In the meantime, she told me that the bacteria was not pneumonia but a strong and resistant bronchitis that would respond to a good night of dripped antibiotics and drugged sleep. Mario said goodbye to me as I drifted off to sleep, my antibiotics dripping successfully at last; my eyes dried for the first time that day. Today is Thursday. I was discharged the following day with my doctor's blessing and some oral antibiotics that I am scheduled to finish tomorrow. Since then I have had a good amount of healing and a lot of checking up from friends who are half-way chiding me for not letting me know I was in hospital.